Digging like crazy. That’s what Bill Perry and his team of five archeologists have been doing since early May in southern Alberta’s Waterton Lakes National Park. They are in a race against growing vegetation that was burned off by a major wildfire last September. For Perry’s team, the exposed soil presents a unique opportunity for archeological visibility and discovery. Within the 19,303-hectare burn zone, they have visited about 120 of 255 known archeological sites, including Indigenous camps, and have found artifacts including arrowheads, stone tools, bison bones and glass beads. Canadian Geographic caught up with Perry, who has worked as an archeologist with Parks Canada for 35 years, during a short break from his fieldwork. We spoke with him about his personal connection to Waterton, the team’s findings and how they contribute to a greater understanding of Waterton’s history as a significant travel and trade route in Blackfoot traditional territory. I grew up not too far from the park, so I've always had this special connection. My uncle had a ranch on the Belly River, which is just outside the park. As kids, we would go up to these archeological sites and look at the teepee rings and the arrowheads that were eroding out and the buffalo bones, and I got an interest at an early age. I eventually studied archeology and got a job with Parks Canada. Last fall, when I first heard that the fire was going through the park, I was putting together a project about First Nations peoples coming down the West Coast and trying to figure out how to get at those sites. I dropped all that as soon as I heard about the fire. We have a small team but they are very talented. One of the archeologists, Kevin Black Plume, is Blackfoot from the Kainai (Blood) Tribe and he's just been grinning ear to ear, because Waterton is in the middle of Blackfoot country. It's also in the middle of a larger area that connects with the Kootenay to the west and the Flathead to the south, southwest. The team is out there five days a week and putting in long hours in this heat. I've never seen them stop smiling because they are just finding incredible stuff. We are in the process of rewriting what we thought we understood about archeology, and the whole Waterton story is about to change based on what we are finding — so very cool stuff. It's an amazing opportunity and we are very privileged to be allowed to do it. A lot of what we thought we knew doesn’t stand the test of time anymore because we can see so much more. In the areas where the fire burned intensively, it’s taken off all the vegetation right down to the soils. What that's created is its own bias toward the last thousand years or so. 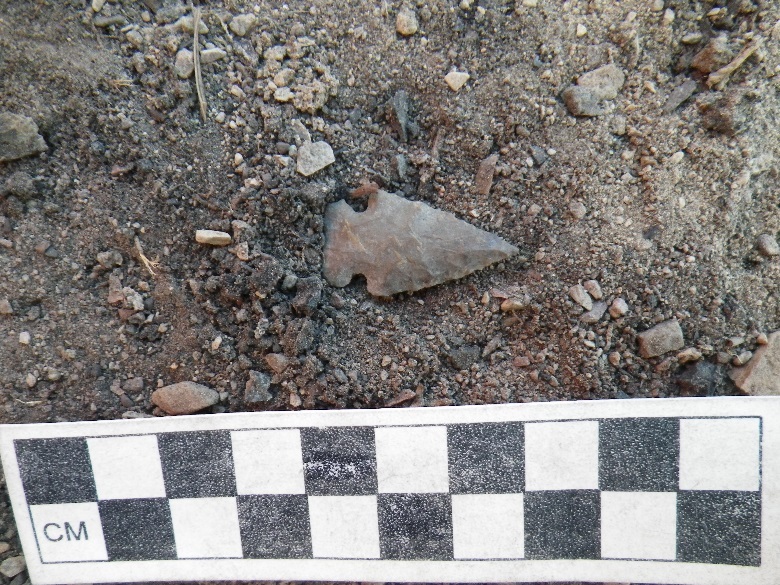 So all of the arrowheads that we are finding are from that time period. We are finding a lot of artifacts; a lot of stone tools, a lot of burnt and butchered bison bone. And we are finding them in places we would normally have written off. We are being educated as far as where to look for archeology. The most amazing artifacts, in my view, have been the protohistoric, which is the era between the prehistoric or the Indigenous eras and the historic era, and it's that point of contact where trade goods are flowing back and forth. We are picking up metal trade points [metal arrowheads primarily traded by early explorers and fur traders to Indigenous people], glass trade beads and a lot of personal adornment items. Waterton is in the middle of Blackfoot country, but in terms of cultural affiliation, all we can say is that the sites are from ancestral Indigenous peoples because the cultural affiliation is invisible, as far archeology goes. We can make inferences because of cultural territories at the time of contact with the fur traders and explorers, but that direct connection is just not there, like in the prehistoric sense. I used to think of Waterton as just a good place to be; it had a nexus of resources such as food (bison), shelter, lakes etc. I knew about the presence of the mountain passes that allowed access to other regions, such as the South Kootenay Pass where trails and passes connected the Blackfoot and Kootenay. But now I see the extent of these trails, accompanying trade goods, and stone tools made of exotic imported materials that speak to the role of Waterton as not just a destination but a hub in a far-reaching travel and trade network linking regions and cultures. We started off with the trail networks and trying to sort those out. As it turns out, everything leads into two main valleys in the park; one is the Red Rock Canyon area and the other is up the Akamina pass area along Cameron Creek. These two areas are the focus for the travel networks. I started walking down the valley slopes going from one old trail to another and realized that what I was doing was actually walking back through time as I got closer and closer to the creek level. I wouldn't be surprised if this travel and trade network hasn't been in use for thousands of years. And so that was a thrill, actually working all that out. The other thrill was realizing that a lot of what we thought we knew doesn’t stand the test of time anymore because we can see so much more. We can stand on the shoulders of the people that have done previous archeology in the park and actually see way further than they ever could, just because of this unique circumstance of having all of this archeological visibility. From an archeological standpoint, the bias of the fire is within the last thousand years but it's a crucial thousand years of history for the area and the park. You've got significant changes taking place – the bison are disappearing in the 1800s, and you’ve got massive cultural change occurring through contact with the Europeans. And now that we can see a lot more of what’s going on, we can start to see some of these trends showing up on the environment, on the people and on the region. It's a thousand years that we really didn't know a heck of a lot about in the park, so it's been eye-opening in that way. What it all leads to is it’s filling in this giant puzzle. We've had a few pieces here and there, and we were speculating about what the past picture looked like in between these individual puzzle pieces. Suddenly, this year, we have a whole bunch more pieces and we've got a significant revision of what we thought was going on. This fall, we will be going through all of the information and evaluating it in terms of which sites can actually help us understand some basic research questions, like access into past environments, past fire histories and questions like Indigenous burning. We will also be pulling together year two, if the funding holds. We will be doing some public archaeology excavations and targeting the sites in order to do some block excavations so that we can flesh out that story for a lot more pieces of the bigger picture.